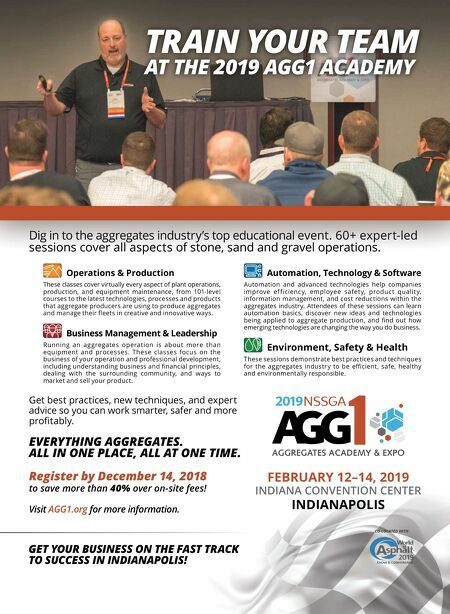 FEBRUARY 12–14, 2019 INDIANA CONVENTION CENTER INDIANAPOLIS Dig in to the aggregates industry's top educational event. 60+ expert-led sessions cover all aspects of stone, sand and gravel operations. Operations & Production These classes cover virtually every aspect of plant operations, production, and equipment maintenance, from 101-level courses to the latest technologies, processes and products that aggregate producers are using to produce aggregates and manage their fleets in creative and innovative ways. Business Management & Leadership Running an ag gregates operation is about more than equipment and processes. These classes focus on the business of your operation and professional development, including understanding business and financial principles, dealing with the surrounding community, and ways to market and sell your product. Automation, Technology & Software Automation and advanced technologies help companies improve ef f icienc y, employee safet y, produc t qualit y, information management, and cost reductions within the aggregates industry. Attendees of these sessions can learn automation basics, discover new ideas and technologies being applied to aggregate production, and find out how emerging technologies are changing the way you do business. Environment, Safety & Health These sessions demonstrate best practices and techniques for the aggregates industry to be efficient, safe, healthy and environmentally responsible. CO-LOCATED WITH GET YOUR BUSINESS ON THE FAST TRACK TO SUCCESS IN INDIANAPOLIS! 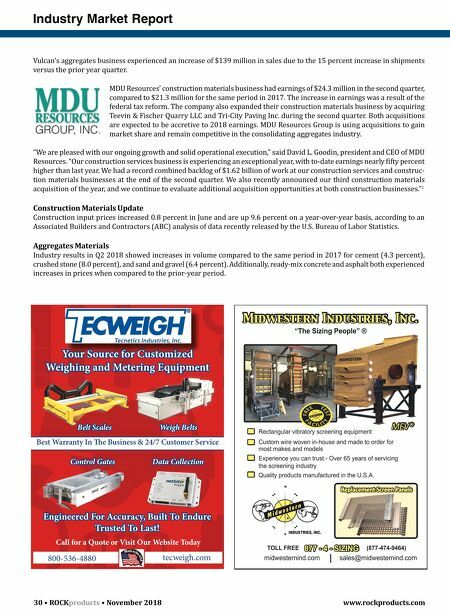 Dig in to the aggregates industry's top educational event. 60+ expert-led sessions cover all aspects of stone, sand and gravel operations. Dig in to the aggregates industry's top educational event. 60+ expert-led sessions cover all aspects of stone, sand and gravel operations. sessions cover all aspects of stone, sand and gravel operations. Dig in to the aggregates industry's top educational event. 60+ expert-led TRAIN YOUR TEAM AT THE 2019 AGG1 ACADEMY Get best practices, new techniques, and expert advice so you can work smarter, safer and more profitably. EVERYTHING AGGREGATES. ALL IN ONE PLACE, ALL AT ONE TIME. Register by December 14, 2018 to save more than 40% over on-site fees! Visit AGG1.org for more information.